It is 129 years old, treadle-operated, and an Industry 1.0 gem. The company founder Robert Bosch himself worked with this 300-kilogram cast-iron lathe beginning in the years after 1887. Among other things, it was used to manufacture parts for the magneto ignition device − the very product that helped the company to achieve its breakthrough at the end of the 19th century. 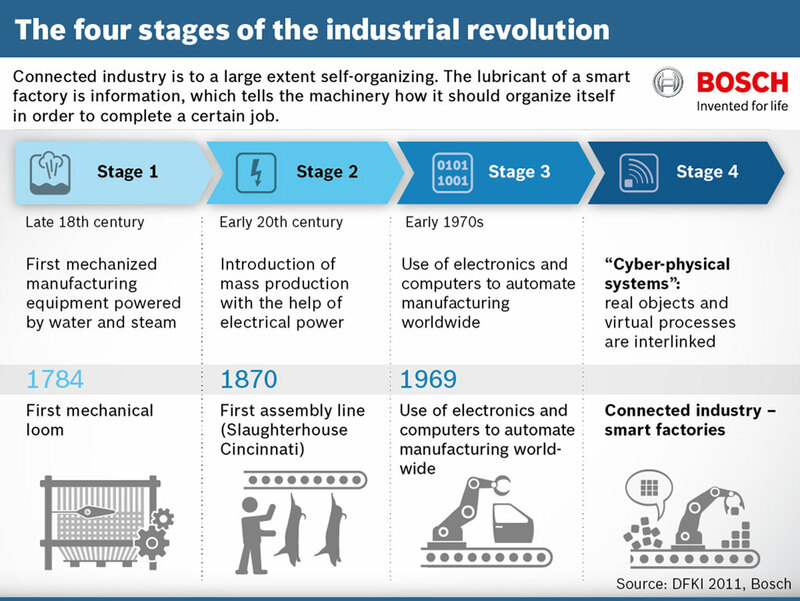 “Many of the machines used in skilled trades or manufacturing are still not connected to Industry 4.0. Among other things, they lack sensors, software, and connections to companies’ IT systems – which means that they do not fulfill the essential prerequisites for connected industry. In Germany alone, the number of such machines runs into tens of millions. And globally, the market for retrofit solutions like the Bosch IoT gateway is worth billions,” Struth said. He noted that industry needs connected machines if it is to be successful over the long term. That is exactly what the IoT gateway ensures − quickly and flexibly. With this gateway, Bosch shows how operators of older manufacturing systems can connect their machines, and thus monitor them in real time and optimize them. This enables things such as predictive maintenance, reducing downtime while increasing productivity. The IoT gateway makes sense technically and economically: innovation cycles in mechanical engineering differ from those in many other industries. Once purchased, machines often remain in use for decades. They can only be changed to meet new demands at great effort and expense. A large part of the installed machinery worldwide is therefore still not networked with connected industry. The need for retrofit connected-industry solutions is correspondingly huge. The same holds true for Bosch: “We are already using the IoT gateway ourselves and saving money. And our subsidiary Bosch Rexroth will be offering our customers this solution from this fall,” Struth said. The IoT gateway will be presented to a specialist audience at the sps ipc drives trade fair. At the Bosch plant in Homburg, for example, engineers have connected a 2007 test facility for hydraulic valves with the IoT gateway. Thanks to new sensors that monitor the quality of the oil used, it is now possible to determine the point at which oil needs to be changed much more precisely than before. This saves time and money, and is good for the environment. In this specific case, retrofitting with the IoT gateway paid for itself within just 18 months. In a next step, Bosch will retrofit 22 of its other test facilities and then a number of other machines. Aside from the gateway, Bosch also provides the software necessary to analyze, prepare, and present the data on the Bosch IoT Cloud, for example. operation much faster. Configuration uses the new, open machine language (PPMP, production performance management protocol) that was presented recently. After having been “tuned” for Industry 4.0, the museum lathe is ready for essential new features of connected manufacturing. One of these is process monitoring for constant quality assurance, another is condition monitoring in order to prevent unplanned downtimes. For process monitoring, sensors measure a range of values, including the speed at which the workpiece turns. Cutting speeds that are too high or too low decrease the quality of turned metal parts and can damage the tool. For example, a look at a monitor reveals the data recorded and transmitted by the IoT gateway data, showing the workers operating the treadle that they have to pedal faster or slower in order to reach the ideal speed. In addition, the newly connected lathe recognizes gradual changes to the drive belt. As it grows older, the leather belt can slip between the drive wheel and the spindle carrying the workpiece. For the human eye, this process is initially imperceptible, but sensors can already recognize deviations in the low percentage range. Once a predefined threshold value – 2 percent slip, say – has been reached, the connected system automatically notifies the maintenance worker responsible, who replaces the belt within a preset period. In this way, the sensors, gateway, and software prevent unplanned downtime of what is now an Industry 4.0-enabled lathe. This increases productivity. Robert Bosch bought the lathe in February 1887, and also worked on it himself. It seems to have been in use until 1901. Converted to today’s currency, what was a purchase price of 507 German marks is the equivalent of around 30,000 to 40,000 euros – for the small company that Bosch had only founded in 1886, it was a considerable investment that was calculated for the long term. “It’s still the same today: Machines are expensive. We have to use them as efficiently as possible. Connectivity can play a decisive role here,” Struth said.